THE NRMA Insurance Broncos can confirm the club has signed Queensland Emerging Origin front rower Lama Tasi. Tasi, 23, has received an immediate release from the Roosters and will head back to Queensland. At 190cm and 108kg Tasi will add bulk to the Broncos' roster, said General Manager of Football Operations, Andrew Gee. Chooks offloading some of the big boppas. Leeds prop Ryan Bailey has rejected NRL offers from Australia to remain a one-club man with the Super League champions. The 29-year-old forward, who joined the Rhinos straight from school, was the only remaining out-of-contract Leeds player not to sign up for 2014, but has agreed to a new two-year deal. Bailey, one of only five players to have appeared in all six of the Rhinos' Super League grand final triumphs, had been linked with a move to Brisbane and said there had been offers from more than one NRL club. AN angry Peter Wallace has been left in disbelief after being told by the Broncos to find a new home for next season - a decision that could cost the former Origin star as much as $400,000. In moves that suggest planning for next year is already under way at Red Hill, coach Anthony Griffin yesterday revealed a host of changes to his misfiring line-up, headlined by the axing of Parramatta-bound fullback Corey Norman and Wallace being dropped to the interchange bench in favour of youngster Ben Hunt. BRISBANE have scored a $1 million coup, with Martin Kennedy, the Queensland Origin hopeful spotted by the late Arthur Beetson, agreeing to join the Broncos until the end of 2016. On a day of recruitment drama for the Broncos, The Courier-Mail can reveal Kennedy, a 118kg prop, is bound for Red Hill after being granted permission to negotiate by the Roosters. K Hunt might also be on the cards. Scott Prince is facing the prospect of retirement, with the Broncos indicating the veteran playmaker will not be an integral part of the club's plans next season. As he prepares for Brisbane's must-win game against the Cowboys on Friday, Prince's 15-year career could soon be over after discussions with Broncos hierarchy about his future. Not sure if there was a post to cover the Round 17 début of Corey Oates so maybe this will suffice. Brisbane coach Anthony Griffin denies Corey Norman's dumping is due to his move to Parramatta next season. THERE is nothing baby about this Bronco. Teenager Corey Oates might be lining up for only his third NRL game but he has the size and temperament to become a mainstay of the rebuilding side. The central Queensland product is already 20kg heavier and 6cm taller than Cowboys winger Ashley Graham, his opponent on Friday night. The Broncos expect him to add at least another 7kg to his frame which is conservatively listed in the NRL media guide as 105kg. "He's only a bub but he's a big hulk of a boy," said Brisbane under-20s manager Scot Czislowski, who has watched the youngster's development closer than most. The 18-year-old grew up on a cattle property in Baralaba, west of Rockhampton, the son of a builder and grazier. Little fazes him, not even his NRL debut three weeks ago against Melbourne. He played 55 minutes that night, about 30 more than planned after he replaced injured centre Jack Reed. He scored a try in his maiden start against the Sharks, making it difficult for coach Anthony Griffin to leave the laidback country kid out of his run-on side for the important meeting with North Queensland in Townsville. "I haven't got (first grade) mastered yet," said the graduate of St Brendan's College Yepoon. 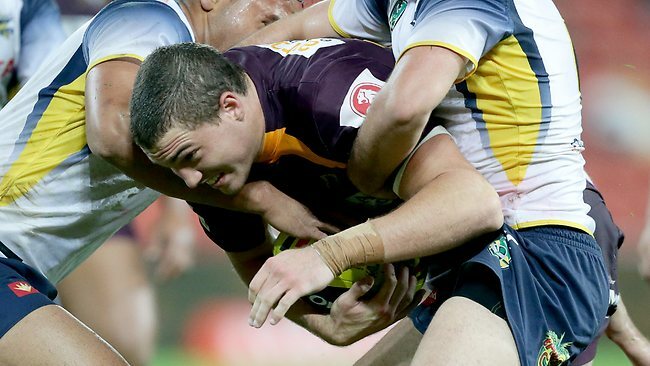 Corey Oates of Brisbane during the Under 20's match between the Broncos and Cowboys at Suncorp Stadium. "It's a lot faster than what I'm used to and they're much bigger blokes. "There's no small ones to pick on. "This will be a good test against one of the top try scorers (Graham)." Oates played fullback as a youngster but is more comfortable in the centres or back row. He has been named on the left wing against the Cowboys and will form a new look partnership with Alex Glenn. Oates' height makes him a target for attacking cross-field kicks from new halfback Ben Hunt. He will also be tested defensively by kicks from Cowboys playmaker Johnathan Thurston who will no doubt be aware of the youngster's inexperience on the wing. "I've talked to a fair few blokes about what to expect," Oates said. "I've been watching a lot of video and asked questions from all the other good wingers. "For the two nights leading up you think about not making any mistakes, but I think I'll be OK."
I really liked Hoffman at fullback, thought he should have got MOTM. Only reason Hodges got it was he scored the winning try. Also Ben Hunt was more creative than Wallace has been for some time. Milford and Barba - if they get them - will take a fair slice of the Cap. And will give them that x-factor they seriously lack. Not surprised that Wallace is on the outer. He was over rated at the Panthers and more so at the Broncos. He's a solid player, but nothing more. Josh Hoffman is a surprise candidate for the Broncos five-eighth role after rejecting a straight-swap proposal to replace Ben Barba at Canterbury next season. A pay rise now beckons for Hoffman, who has an agreement with the Broncos that he is eligible for an upgrade if the NRL’s salary-cap rises above $5.5 million, which will occur next season. Surely they wouldn't do this - ie swap him for BB ? BRONCOS legend Darren Lockyer says Ben Barba is not worth $1 million a season as Brisbane boss Paul White labelled his asking price "ridiculous". The protracted Barba saga appears headed for resolution, with Canterbury CEO Raelene Castle indicating the Bulldogs board would finalise the matter within 10 days. Reports have indicated Barba's management is seeking a seven-figure package, comprising a base salary of $500,000 annually plus a similar amount in marquee and third-party agreements. I agree - he's a $400k man to me. Scott Prince announces his retirement at season's end. One year left on his contract .... ! THE Broncos have continued their recruitment and retention drive with rookie utility Jake Granville shunning interest from the Cowboys to remain at Red Hill. On a day when Brisbane announced the prize signing of Ben Barba, Granville has secured his own future by inking a one-year deal with the Broncos. BRISBANE mentor Anthony Griffins future is again under a cloud amid growing speculation Wayne Bennett and Kevin Walters could form a coaching alliance to rebuild the Broncos in 2015. It comes as Broncos legend Darren Lockyer warned Ben Barba won’t single-handedly cure the club’s ills next year in a campaign that could make or break Griffin’s tenure at Red Hill. While missing the finals for the second time in four seasons is unpalatable for Broncos hierarchy, they are backing Griffin for next season, believing he needs greater resources to revive the club as a premiership force. The Brisbane Broncos have moved to beef up their inconsistent forward pack by signing Sydney Roosters prop Martin Kennedy on a three-year deal. Kennedy, on the fringes of Queensland State of Origin selection this year, adds 122kg of muscle to the Broncos pack in a switch which comes three days before the Roosters' NRL qualifying final against Manly. The NRMA Insurance Broncos have officially signed three new players to the club – Todd Lowrie, Daniel Vidot and Stewart Mills. Highly experienced second-rower Todd Lowrie comes from the New Zealand Warriors and has signed a two-year deal with the Broncos. Powerful outside back Daniel Vidot is arriving from the St George Illawarra Dragons and has also signed a two-year deal with the Broncos. Young centre Stewart Mills has signed a one-year deal with the Broncos from the Cronulla Sharks.